Members of the public will have an opportunity to make an input in theÂ Economic Growth Strategy and Delivery Plan for Montserrat, before it is finalised, says the Government of Montserrat (GOM). The growth strategy and implementation plan is being developed with the aim of providing a self-sustaining economy forÂ Montserrat. The consultants are expected to complete the plan before the end of 2017. 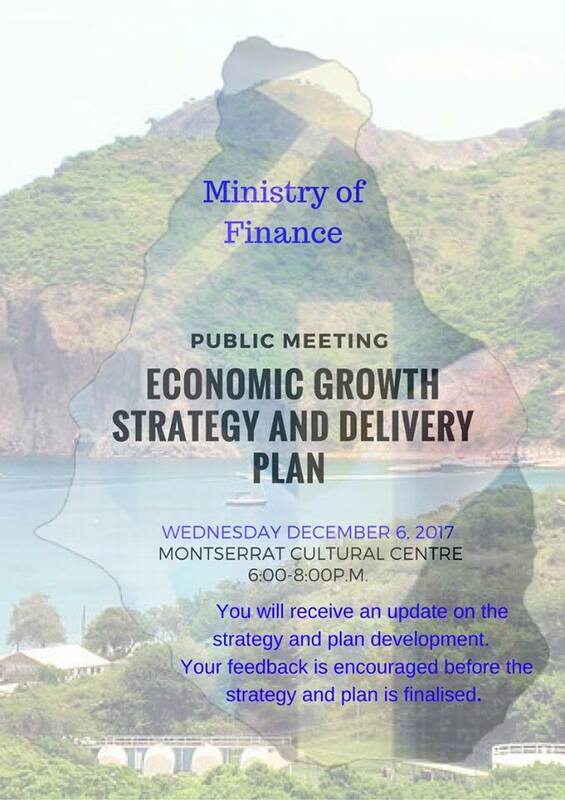 Consultancy firm, Mott MacDonald, appointed through the Ministry of Finance and Economic Management to produce the plan, will conduct a two-hourÂ session on Wednesday, December 6, 2017 from 6PM to 8PM at the Montserrat Cultural Centre. During the meeting, the consultants will provide an update on the plan development process and the areasÂ of focus for economic growth. They will also engage the audience for their input which will be taken intoÂ consideration before the team finalises the Growth Strategy and Plan for Cabinet approval. He further noted that the plan must have the full support of all sectors for its goal and objectives to beÂ realised. â€œThe plan must be a document that the Government of Montserrat (elected members and officers), other public agencies, private businesses and residents can all get behind and support. It will actÂ as a clarion call for a renewed focus on the island’s economic development and, importantly, signal toÂ private sector investors that Montserrat is open for business,â€ stated the Chief Economist. The plan development process involved a mixed methodology approach, which included desk basedÂ research, on island and telephone consultations and utilising established regional and international bestÂ practices to guide its development. ï‚· Develop an Economic Growth Strategy with the overall aim of developing a self-sustaining economyÂ over the next 10 to 20 years. ï‚· Translate the Economic Growth Strategy into a prioritised Delivery Plan that demonstrates aÂ practical, realistic and realisable path to self-sustaining economic development model. The Economic Growth Strategy and Delivery Plan should be a clearly defined and goal-oriented growth planÂ to provide a long-term roadmap for the government, businesses, donors and, potential investors as to how,Â by working together, the goal of creating a strong and sustained economic growth for Montserrat isÂ achievable.